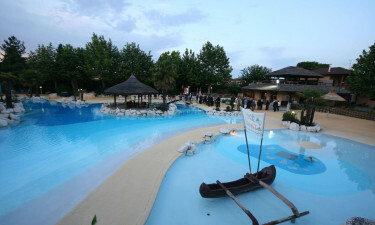 The Tahiti camping and thermal bungalow park is a prime destination for any camping trip in Italy. This luxury camping site offers a host of unforgettable activities to enjoy. As it is located within natural settings and close to a Mediterranean lagoon, this environment is also able to display a sense of profound relaxation. To learn more about this camping holiday possibility, do not hesitate to speak with a knowledgeable representative at Lux-Camp for further details. Why go to Camping Tahiti? What are the reasons that I should take my family to Camping Tahiti? A thermal oasis and "wellness gardens"
Although the selection of bungalow tents, on-site mobile homes and even luxury tents is quite impressive, the most prominent quality of Tahiti Village is the fact that the historic and natural beauty of the surrounding region can easily be visited. In fact, cities such as San Marino, Ferrara and Venice can be visited during any luxury camping hiatus thanks to organised trips. For those who wish to experience the verdant nature which abounds, boat and bike tours to Parco Delta are also a possibility. When searching for a veritable home away from home, camping in luxury has never been easier. Tahiti Village offers some of the most modern facilities known to man. These include television access within mobile homes and bungalow tents, waste disposal, gas bottle exchange, a central campfire and a massive lounge. In fact, even charcoal grills are permitted here. Perfect for children and adults, the luxury camping site of Tahiti Village leaves little to the imagination in reference to sports and other activities. You can participate in such sports as table tennis, volleyball, miniature golf and bicycle riding. Children's play areas are likewise available and for those who are a bit more intrepid, sailing and surfing excursions should not be missed. After a long day, you can immerse yourself in an on-site thermal spa. Once again, these are all hallmarks of a quality camping holiday. Of course, no luxury camping experience would be complete without the addition of local services such as restaurants and bars. 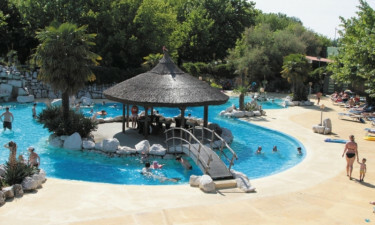 The holiday camping site of Tahiti Village offers both. Some examples are the BoraBora and the Moorea Pizzerias; each serving up delectable local and international delights. 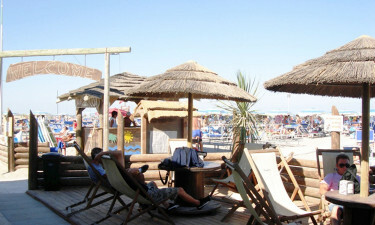 Also, a number of unique cocktail lounges can be found such as a disco pub and a beach bar. Wide terraces offer excellent views of the nearby environs while live music and dancing are regular activities. When you need to stock up on groceries, a supermarket known as SISA is close to all luxury tents and mobile homes. Boasting a large array of fruits, vegetables and organically grown meats, you will be able to enjoy competitive prices alongside environmentally friendly foods. So, a home-cooked meal at this luxury camping site is always a possibility. Please contact Lux-Camp for further details. Swin laps in the olympis pool or simply relax at the Aqua Therm Beach pool.